Launched in 2006, Fleet Management Systems and Technologies (FMS Tech) is a transportation logistics, mobile asset protection pioneer and innovator of IVMS, In-Vehicle Monitoring Systems and on-board computers technology. 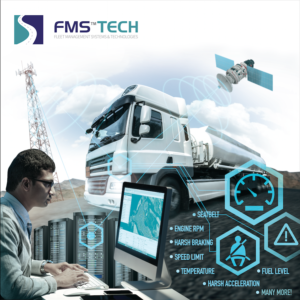 Established in the capital of the UAE since 2011, FMS Tech specializes in fleet management systems, its products and services are solution driven and help customers maintain road safety and fuel efficiency. Taking pride in 7 years of local experience and its state of the art technology, the company guarantees its products are 99% accurate. dustry – delivering sophisticated technology in line with Dubai’s vision of becoming the smartest city in the world,” comments founder and CEO, Bassam Alkassar. “We meet our goals by delivering unmatched and customized solutions to our valued clients and our growth is our biggest evidence to our success and the values we deliver. FMS Tech offers a range products which revolve around road safety solutions and include features like in-vehicle monitoring system, accident reconstruction, hands free calling, journey management to calculate the most fuel and resource efficient route, plate recognition, CCTV surveillance, tracker and safety brake sensors for public and school buses, driver merit system, and more. These smart assets can also reduce unnecessary trips thus saving fuels and limiting toxic CO2 emissions, making UAE greener and safer. Catering to the constantly evolving transportation market in Dubai and Abu Dhabi, FMS Tech offers clients multiple perks with its cutting-edge technology. Not only will the customers notice safer driving habits among employees, less accidents, and reduced downtime; they will also experience the cost saving benefits of a more efficient fleet. As an additional savings- clients are provided the benefit of automated data collection, reporting, and outsourced monitoring. The core industries FMS Tech services are logistics, oil and gas, rental cars, municipality, health and safety, construction, law enforcement, school and public transport. FMS Tech aims to maintain it’s stature to keep UAE greener and safer for all their publics by reinforcing safer driving habits and efficient resource allocation through constantly evolving IVMS technology and their superior fleet management systems.